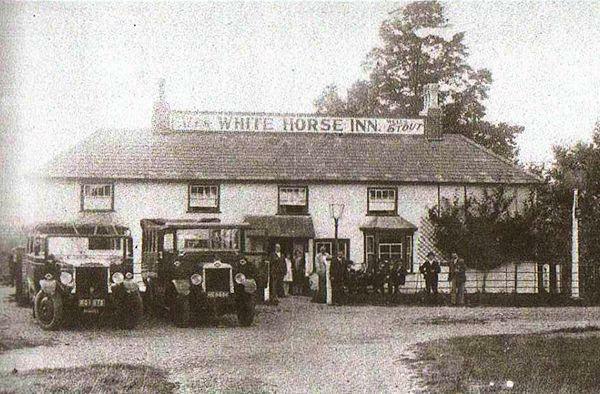 A History of the "Last Pub Serving"
The White Horse Inn was built around 1700 and is the only surviving pub in the village. 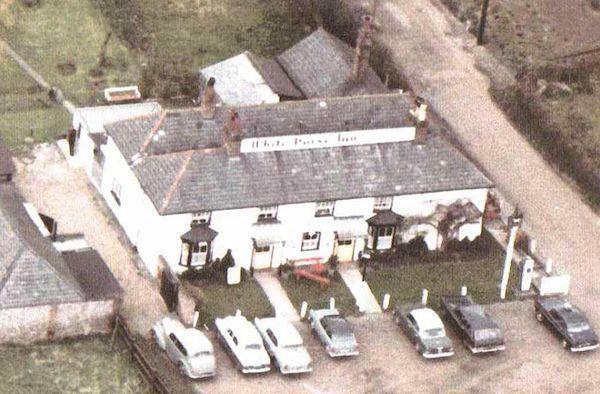 We have photographs, documents and history of the "Last Pub Serving". In 1748 Swedish scholar Peter Kalm made a visit to England. Here he records part of his visit to Eaton Bray. In Eaton Bray where we dined, the landlord showed us his cellar he had his ale and beer which was situated close to a little running beck, and so arranged that the water came to run into the cellar right under the middle of the beer barrels. On either side of the cellar was a row of beer barrels , and the water ran under each row, for which purpose it was also at the entrance to the cellar devided into two branches. He assured us that the beer never turns sour in this cellar in summer, but is kept quite fresh by this water running below. When he wished he could always exclude the water from his cellar, if only the hole was closed again, through which it ran in. When it flowed its course in the beck itself which ran close by the cellar. 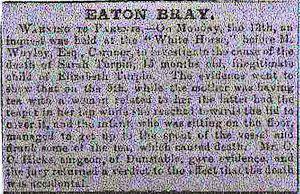 We believe the above is one of the earliest mentions of the White Horse Eaton Bray. 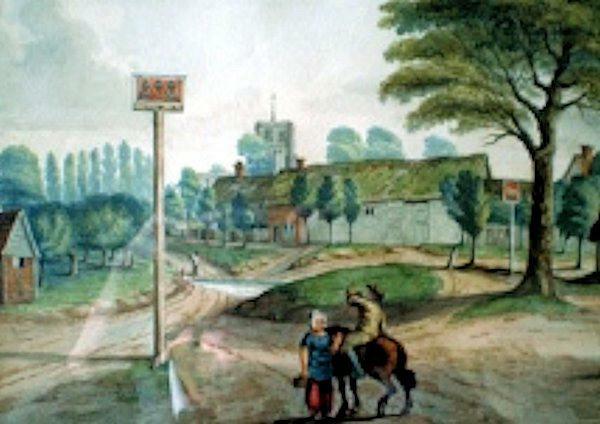 There was little change in the village in the 18th century and the painting by Thomas Fisher in 1820 seems to back up our belief. Note the Ford crossing the road and flowing to the side of the White Horse. The following list has been researched by the Bedfordshire and Luton Archives. The White Horse was also used for court hearings, inquests and sales. This is an article from the Bedfordshire Mercury published on 21st February 1871. 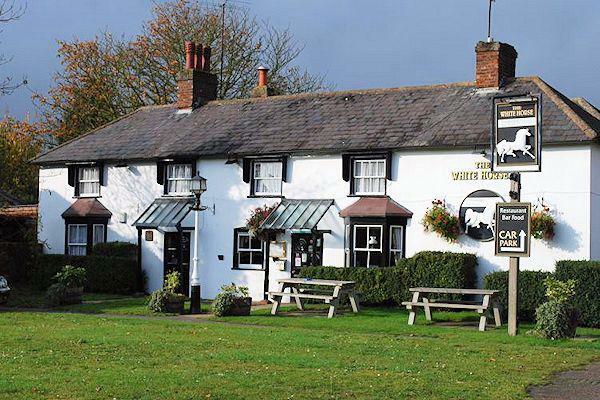 Warning to parents - On Monday the 13th an inquest was held at the "White Horse" before M Whyley Esq, Coroner to investigate the cause of the death of Sarah Turpin, 15 months old illegimate child of Elizabeth Turpin. The evidence went to show that on the 9th, while the mother was having tea with a woman related to her the latter had the teapot in her lap while she reached towards the lid to cover it, and the infant, who was sitting on the floor managed to get up to the spout of the vessel and drank some of the tea, which caused death. Mr C C Hicks surgeon of Dunstable, gave evidence, and the jury returned a verdict to the effect that the death was accidental. The young girl in the doorway is said to be Hilda Reeve. The sign on the roof was taken down in the 1970s after it was found to be damaging the chimneys holding it. The White Horse as it looks in 2012.